Discover a new museum, La Vigna di Leonardo, just a short distance from the Church of Santa Maria delle Grazie where Leonardo painted The Last Supper! The public can finally visit the House and Vineyard thanks to a one-of-a-kind museum tour divided into seven designated areas (the courtyards of Piero Portaluppi, the Zodiac Hall, the Luini Hall, Ettore Conti’s studio, the Staircase Hall, the Garden of Earthly Delights – the novellas of Matteo Bandello and Leonardo’s Vineyard). 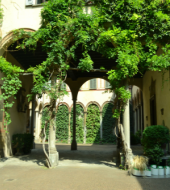 The vineyard was a gift from his patron, the Duke of Milan, Lodovico Sforza, who gave it to him in 1499 a few years after da Vinci had finished what many consider his masterpiece, The Last Supper in the church of Santa Maria delle Grazie which is nearby. The vineyard remained in da Vinci’s possession for the rest of his life and though he died in France in 1519 (in the Loire no less), he bequeathed the vines to his two most loyal servants and their families looked after them until they were destroyed by an Allied bombing raid in World War II – attacks which devastated the city in general. Although some of his most famous works come from his time in Milan, da Vinci was a Tuscan by birth and the town of Vinci where he was born, even to this day, is surrounded by vineyards. Codex Atlanticus Skip the line!